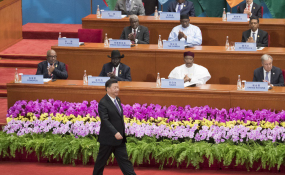 Beijing — President Xi Jinping yesterday declared that the Forum on China-Africa Cooperation is hinged on the principle of non-interference in the internal affairs of members and a realisation of the importance of multilateralism. He was delivering the keynote address at the official opening of the two-day 2018 Beijing Summit of the Forum on China-Africa Corporation which was attended by President Mnangagwa and 34 other African Heads of State and government. "No-one who keeps to himself in isolation will have a place in the future," President Xi said, citing that the world was being confronted by the challenge of power politics, protectionism and unilaterism. "China and Africa helped each other over the years, marching on this path, China followed principles of sincerity, greater good, we walked together in sincerity, friendship and equality. "The country follows a 'five-no' approach in its relations with Africa: no interference in African countries' pursuit of development paths that fit their national conditions; no interference in African countries' internal affairs; no imposition of China's will on African countries; no attachment of political strings to assistance to Africa; and no seeking of selfish political gains in investment and financing cooperation with Africa," President Xi said. In the 18-year relationship borne through focac, China has been accused by western countries of pursuing a new form of colonisation by extending loans which pushed Africa into debt. In spite of that, President Xi renewed China's commitment to the cooperation by announcing another pledge of $60 billion in affordable loans which will be used to assist Africa in eight areas of focus. The implementation spans from 2019-2021 in areas of Industrial Promotion, Infrastructure Connectivity, Trade Facilitation, Green development, Capacity Building, Health-Care, People to People exchanges as well as Peace and Security. The pledge follows the completion of a three-year commitment of a similar amount announced at the Johannesburg Summit in 2015. In addition, President Xi announced an exemption of debt maturing by 2018 owed by African countries under this cooperation. "China takes a people-oriented approach. We will fully honour the promises we have made to our African brothers. No one could, out of imagination or assumption, deny the remarkable achievements made in China-Africa cooperation," he said. Sharing the same sentiments at the summit themed 'China and Africa-Toward an Even Stronger Community with a Shared Future Through Win-Win Cooperation,' co-chair of focac and President of South Africa Cyril Ramaphosa said the partnership refuted claims that a new colonisation is taking place. He outlined progress made in trade volume between China and Africa, agriculture modernisation which improved productivity, infrastructure development impacting on connectivity and integration as well as improved public health as evidence of this cooperation. "The progress made demonstrates the tangibles of focac. Our relationship is forged on the fundamental right of Africa to determine its future. "We applaud China for keeping to its promises," President Ramaphosa said. The curtain comes down on the summit today with Presidents Xi and Ramaphosa chairing the first and second sessions respectively during which leaders of focac members will have the opportunity to deliver some remarks. In winding the summit, Senegal is expected to be announced as the next co-chair with China.